In the early 1960s, Lee Iacocca?then director of the Ford division at Ford Motor Company?convinced Henry Ford II to produce a sporty four-seat car aimed at the emerging youth market. That car, essentially a reconfigured and re-skinned Falcon economy car, became the Ford Mustang, and it changed the automotive world like no other car before or since. In Mustang: Fifty Years, acclaimed Mustang writer Donald Farr celebrates this unbroken lineage of muscle: its phenomenal first-year sales, the new ?pony car? genre it pioneered, and subsequent models that include the Mustang GT, Shelby GT350, Shelby GT500, Super Cobra Jet, Boss 302 and Boss 429?all part of a line of American performance cars that continues on to this day. 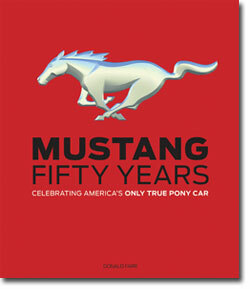 With 400 photos of the USA?s iconic sports car and released in tandem with the Mustang?s 50th anniversary, Mustang: Fifty Years is a must on the bookshelf of any gear head or Ford aficionado.